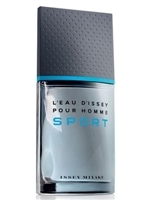 L'Eau D'Issey Sport by Issey Miyake offers a luminous opening full of sparkling citruses and energy. Bergamot and grapefruit provide a strong and dynamic beginning in the opening notes. A heart of the composition offers spicy shades of nutmeg combined with leather, while a base features elegant woody accords of cedar and vetiver.